Do you need help with consular processing? If you live in Montana, North Dakota, or Wyoming, we can help you or your relative collect the immigrant visa through processing for it at a US consulate abroad. This article on consular processing is part of our guide to green cards. If you need information on consular processing please keep reading. If you know you need help now, please contact us. If you are looking at consular processing, you probably have already submitted an immigrant visa petition for your relative. Alternatively, perhaps you are the beneficiary of an approved immigrant visa petition in the United States. Accordingly, your relative or you are not eligible to convert from being a nonimmigrant to an immigrant in the United States through the adjustment of status process. After all, the most common reason for ineligibility for adjustment of status is that you are not in the United States. Moreover, you have no reasonable prospect of getting to the United States to collect the immigrant visa there. If you are located outside the United States and someone has filed an immigrant visa petition for you and that petition has been approved, the next step is converting that petition to an immigrant visa in your passport. The name for this conversion is consular processing. When the petitioner, your relative, or an employer files an immigrant visa petition for you, the petitioner must tell the USCIS about you. In this situation, the USCIS wants to know where you live and whether you would be able to adjust your status. If you are not located in the United States or indicated that you were not interested in adjustment of status, once the United States Citizenship and Immigration Services (USCIS) approves the immigrant visa petition they send it to the National Visa Center (NVC). The NVC is a massive office building located in New Hampshire. It prepares immigrant visa applications for every US consulate in the world. Once the USCIS notifies the NVC of the approval, the NVC contacts you to begin the consular processing. It sends two fee bills, one for the immigrant visa and one for the affidavit of support. To begin consular processing you must pay these fee bills. showing which documents are available for every country in the world. This schedule also helps in making sure that you get the right document to submit to the NVC. Besides police certificates you must produce any prison records or military records if you have any. Besides gathering the forms and documents to support the immigrant visa application, the beneficiary of the immigrant visa petition must apply for the visa. In the old days, this meant completing a two-part DS-230 paper form. The DOS has been on the leading edge of electronic processing. An applicant for an immigrant visa now must complete the application form DS-260 online. The form has many pages, but allows saving your work and coming back to it at a later date. Once you have reviewed the DS-260 you can then submit it. Every immigrant visa application must contain evidence that the beneficiary will not become a public charge in the United States. Put another way, the petitioner must show that the beneficiary will not cost the US government or taxpayers any money. To provide this guarantee, the petitioner in family cases must provide a financial affidavit of support. This is an enforceable promise with the federal government. The petitioner must submit the I864 affidavit of support form along with a current US tax return including all supporting documentation, schedules and W-2 forms. If the petitioner does not make enough money to support the beneficiary, USCIS provides alternatives. In this situation, USCIS allows the use of assets or a cosponsor who also signs another form I864. The cosponsor must be a US citizen or lawful permanent resident and supply proof of that in submitting the sponsorship documentation. Once the petitioner and beneficiary have submitted all required forms and documents to the NVC, it starts processing the case. Unfortunately, the NVC is glacially slow. It is not uncommon to request a status update from the NVC after submitting everything and find that your application is still in the mailroom after 60 days. Once you get out of the mailroom and the application is processed, if the NVC determines that you have submitted all the required documentation, it schedules an interview for you at the consulate abroad where you will pick up the visa. The interview is normally scheduled approximately one month in advance. This gives the beneficiary time to meet local requirements for the interview such as obtaining a medical exam. It also gives the petitioner time to provide original required documentation needed for the visa interview to the beneficiary like the I864 affidavit of support form. The beneficiary of the immigrant visa attends the interview, answering the consular officer’s questions, and providing the required forms and documents. Assuming that this goes well, along with receiving a positive report from the physician, the consular officer should approve the immigrant visa. You will receive a sealed visa packet along with your passport including the immigrant visa. The immigrant visa is valid for six months. But you may use it on the same day that you received it to come to the United States. Consular processing is over. And you are on your way to a green card, lawful permanent residency. Once you arrive in the United States, a Customs and Border Protection officer (CBP officer) will stamp your passport indicating that you were admitted to the United States as a lawful permanent resident. This stamp is good for one year. During this time you must pay a fee to receive the lawful permanent residency card. 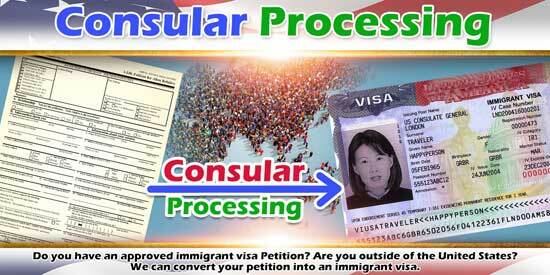 We have helped many clients with consular processing. Sometimes it is sorting out getting all the right documents to make consular processing work. Whatever help you need, we can get your relatives here through the consular processing process. Please contact us.